The female hip hop queen Hard Kaur rose to stardom in Bollywood with her hit number Paisa Phek (Move Your Body) of Johnny Gaddaar and other hits in the movies like Singh is King, Kismat Konnection, etc. Since then, she has proven her talent again and again. Little do people know that this beauty with talent is also smitten with pooch love. Here, she reveals her love for pets. 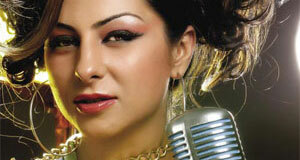 From Birmingham to Bombay, Hard Kaur has had a rewarding journey. Born in India as Taran Kaur Dhillon, her musical journey began at her birth place India but it was her arrival in Birmingham in 1991 that opened a new door to another world where her dreams actually became a reality. She moved to the UK with her mother and younger brother. Having no English language skills in her vocabulary, she immersed herself in a different type of universal language that she instantly connected with ‘music’ and went on to meet her first love…Hip Hop. And the rest, as they say, is a history. Besides music, this talented singer is also immersed in pooch love. Her companionship with pets dates back to her childhood. “I remember my dad used to pick up dogs from the street and kept them in the house and even he used to get in trouble for this,” she giggled. Nevertheless, pets were always an eminent part of her life. “I’ve had one rabbit named Casper, you know, like the ghost in the animated movie of the same name because he was so white. But the first love of my life was my Pit Bull Terrier named Cyrus da virus,” she added. “Cyrus was nice to everyone and he was like a family member. He had his own sofa to watch TV and he would wait for me outside my room until I woke up. Cyrus was loved by the whole community in my hometown in Birmingham. I’ll never forget when a thug tried to rob my mum as she was coming back home from work and he broke through the window and saved her. She was so thankful to him that she was in tears. Dogs truly are human’s best friends,” she added. Today, Hard Kaur shares her life with Bobo, who’s her new Pit Bull. “I flew him in from Punjab and he’s so loving,” she added. “We play and chase each other and I give him bubble baths which he loves. Also he knows that every time I come from a trip abroad, I bring him lots and lots of bones and toys. What I love about him the most is that he loves me so much. He’s very caring and my bodyguard…I think he considers me as his mummy,” shared Kaur. All time favourite activities of Hard Kaur and Bobo are the moments they spent together playing ‘fetch’. Talking about sharing, Hard Kaur mentions that Bobo loves to sleep in her bed, instead of choosing the huge and comfortable one set for him. He is very handsome, loving and full of crazy and funny antics! “The moment he finishes eating or after he’s done poo, Bobo jumps around the room proud of his achievement,” grinned Kaur. Telling about the things Bobo likes, Kaur told, “We give lots of protein to Bobo and he loves to eat carrots too. He loves cheese although we don’t give him that too often. He also loves Marie biscuits and peanut butter as well.” “When it comes to toys, he loves to play with his Kong playball rubber toy, although it only takes him an hour maximum to finish and destroy it,” she laughed. “Whenever you take your dog for a walk, you must wash his paws and tail with dog shampoo to prevent him from getting fleas, ticks and mites while walking. Never give chocolate to dogs as it is like poison to them. Also, do not feed milk as most dogs are lactose intolerant. Love them and you are sure to be loved back – thousands time more,” concluded the responsible pet parent Hard Kaur.